Market prices are unpredictable… but there is one exception. Noble prize winner Eugene Fama states there is one single exception to the unpredictability of market prices. He calls it momentum: weak stocks remain weak in the short term and strong stocks remain strong in the short term. The NanoTrader provides a list for every market of the stocks investors should buy based on the momentum principle. Stock lists based on the Momentum principle. Download a free real-time of the NanoTrader platform. 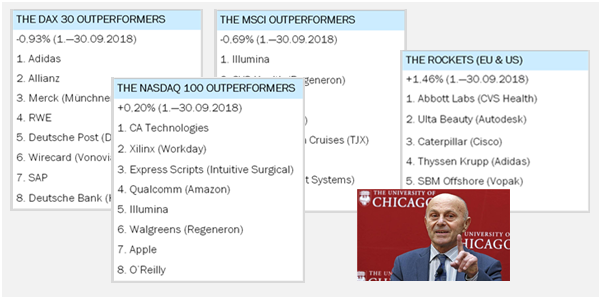 Noble prize winner Eugene Fama’s observation - weak stocks remain weak in the short term and strong stocks remain strong in the short term - lead to the counterintuitive conclusion that far more money is being made by buying high (stocks which are outperforming) and selling even higher. You have now been handed by Professor Fama the mehod on how to manage your stock portfolio so it outperforms the market: replace, on a regular basis, your underperforming stocks with the strongest performing stocks in a market. But... do you really have the discipline and the time to do this? If the answer to this question is ‘no’, then the momentum stocks lists provided by the NanoTrader solve your problem. 8 European and U.S. stocks out of 600 stocks which outperform the MSCI index over 5 and 10 years. These 8 stocks are selected on the basis of their 3-month outperformance of the MSCI index. 8 stocks which are part of the German DAX 30 market index. These 8 stocks are selected on the basis of their 3-month outperformance of the DAX 30 index. 8 stocks which are part of the American Nasdaq 100 market index. These 8 stocks are selected on the basis of their 3-month outperformance of the NASDAQ 100 index. 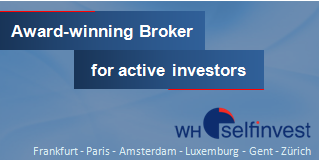 6 stocks, one each from the DOW, SP 100, Nasdaq 100, DAX 30, CAC 40 and AEX market indices. These 6 stocks are selected on the basis of their 1-month outperformance of their respective indices. It apparently does. Several theories are available on why the Momentum principle exists and works. What the ‘right’ theory is, is in essence not relevant. What is relevant is the question if Momentum will be valid going forward. This seems likely to Professor Elroy Dimson of the London Business School. He could confirm the existence of the Momentum principle in a market study covering more than 100 years. The positions held by the different Momentum-based portfolios are shown in real-time in the free SignalRadar app. Discover the stock lists... download a free NanoTrader demo.